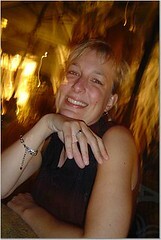 Hors d'oeuvres. We don't really roll that way. Probably because for us, "appetizers" just mean the same food, but perhaps in smaller quantity. (Operative word is "perhaps".) Hors d'oeuvre sizes won't even register. Plus, making tiny, tiny things is labor-intensive! But, hors d'oeuvres is the theme for this edition of First Thursdays at Thursday Night Smackdown, and we wanted to enter something, seeing as we missed the last 3 editions. Granted, given the time constraints, we had to do something fast. We were first debating making breadsticks, but didn't have time. So, what could be easier than a dip! Not usually, anyway. We decided to go with a simple one from the America's Test Kitchen Family Cookbook. They had a Creamy Dip Base recipe -- mainly a combination of mayo, sour cream, lemon juice and s&p -- then suggestions on different flavorings. We didn't have sour cream on hand, so I used drained yogurt in its place. We didn't seem to have anything in the house to make any of their suggested flavors except lemons and feta. It was a matter of combining everything into a bowl and finishing with some mint. All right, I cheated a little. The lemony feta dip was tasting too one-dimensional for me, so I added some leftover homemade Caesar-y dressing into it. Of course, the garlicky, anchovy-y, caper-y goodness enchanced this dip and just added a certain je ne sais quoi. 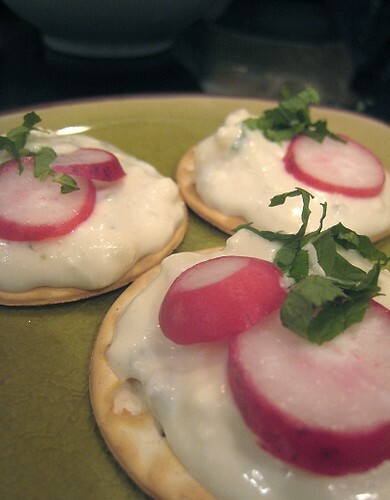 We only had these crackers and some radishes in the house. 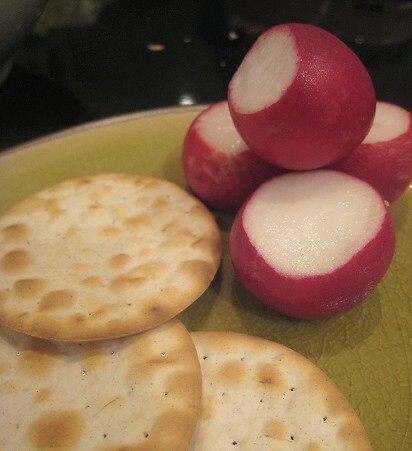 Or, I should say, finding crackers and radishes was as far as I was willing to go in terms of looking for things to dip. 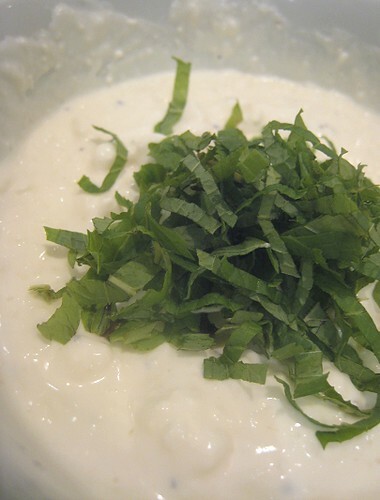 Actually, the radish went really nicely with this dip. They provided a nice robust flavor (that the crackers lacked) to counter the lemony feta dip. One cannot beat its crunch as well. My conclusion: this is better as a crudité dip as opposed to a cracker/chip dip. (Unless it's a very robustly-flavored chip, I guess.) I tried it with celery sticks and carrots the next day and it was great. That being the case, this will also work as a creamy salad dressing, perhaps loosened up a bit. Forgive the non-prettifiedness of my hors d'oeuvres. They're not put together that neatly. In my defense, it was already about midnight when I made this! We're submitting this to First Thursday: Hors d'oeuvres at Thursday Night Smackdown. 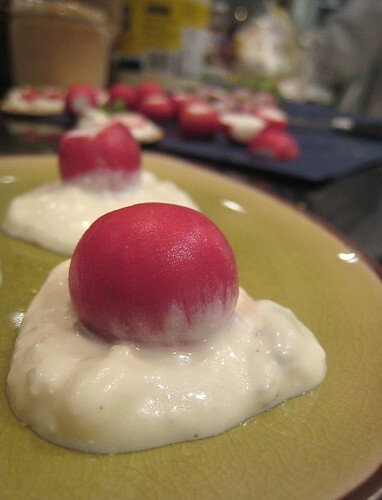 I have never liked radishes but feta might make it edible for me! One dimensional? Try a stronger feta, add another veggie as well, you're dealing with radishes. Beautiful presentation with the vibrant colors! 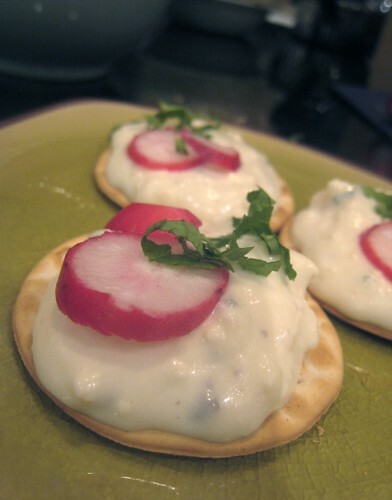 I would have this dip with pita triangles and the radishes sound good too. you can't go wrong with radishes. i've got a couple of thumb-sized specimen from the last CSA pickup. 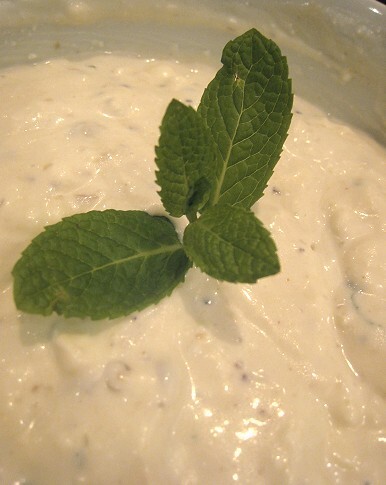 homemade dip might be just what they need. I was eating the radishes just for the dip. Haha. Radishes + dip seemed to work as a good front-of-tv snack for me.